View our live webcam view from the Darlington Hyde Park Hotel. Breakfast is served every morning in our Conservatory Breakfast Room. 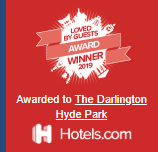 The Darlington Hyde Park is located on Sussex Gardens in the Paddington, Hyde Park area of London, less than a 5-minute walk from the Heathrow Express terminal at Paddington Station. The hotel is conveniently located for both transport links to the rest of London and local attractions. Both Hyde Park and Oxford Street with all its shops are a short stroll away. Our 40-bedroom former Victorian terraced town house conversion offers a high standard of accommodation with free Wi-Fi, ensuring that the expectations of our guests are met, without detracting from the history of the buildings. Our aim is to make your stay with us as enjoyable as possible and to be helpful in making your visit to London memorable. The cleanliness of our rooms and facilities is also very important to us, and we know that it is also essential to our guests, many of who have returned to stay with us over the years. We are very proud to have achieved excellent reviews on Trip Advisor, where we have a 90% approval rating and earned their Certificate of Excellence each year. In 2015 we were welcomed into the Certificate of Excellence Hall of Fame. 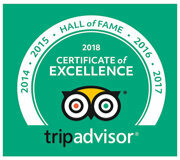 This unique accolade is granted only to those businesses that have won the Certificate of Excellence for five years in a row.